Three pairs of leaves for the draw. 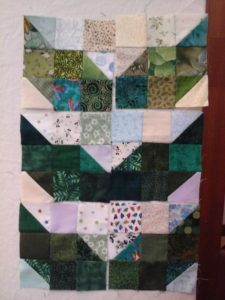 I made nine more blocks but, until I realised that I wasn’t checking that the half square triangles were sewn to the right size, they were all ended up just a bit too small. I know that Sophie allows a tolerance with the block sizes, but I am happy to put them in my orphan box! Once that issue was overcome I started working on the OMMS blocks. ….what a pleasure! Karen N.